These two beauties are the last in a long line of Filandre cats and are happy. purry lively kittens. I have 1 male lilac .Burmese colour . silver and 1 female lilac silver. their siblings are now happily settled with their new slaves.They were born and live in the house with their Mum and half brother so are used to all domestic noises. They have had 2 visits to the Vet for their vaccinations for flu. enteritis and leukaemia also microchipped. registered with the GCCF. wormed and flea treated. 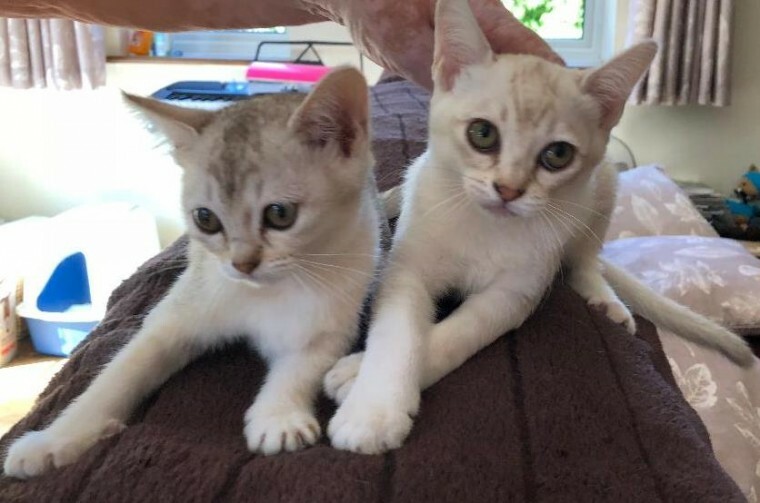 If you want kittens who love life then these two are for you but don..t expect to sit with an empty lap and be prepared to retrieve them from the tops of cupboards or curtain rails. inside drawers and in my case inside the pull out larder. They have only have 2 speeds fast and stop .asleep..